The Moai statues on Easter Island stand as awe inspiring testament to a now lost civilisation. The mysterious heads, carved from stone, are a remarkable achievement of human endeavor, yet little is known about the fate of the people who created them. 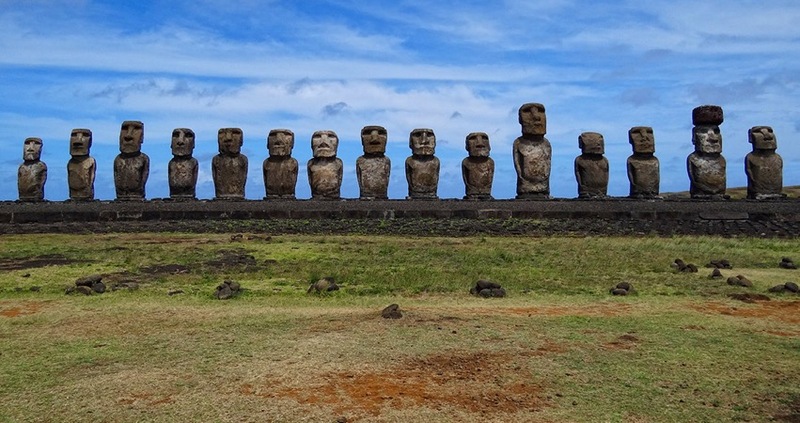 A new study, published in the open access journal Frontiers in Ecology and Evolution, has attempted to provide an answer to the question of the fate of the Rapa Nui people by taking a holistic approach to new evidence discovered over the last decade. According to records, when Captain Cook first set foot on Easter Island in 1774, only 700 Rapa Nui remained. What caused the island’s population to sink so low is a mystery, but there are a number of popular hypotheses. The prevailing view of the island’s history is that it is a microcosmic example of human selfishness leading to a population’s extinction. This narrative claims that the island was first settled by people from east Polynesia sometime between 800 and 1200 CE. As the island’s population expanded, the people started to over-exploit its resources, triggering an ecological catastrophe which in turn led to a social one. Scientific evidence supports this hypothesis by revealing a period of dramatic deforestation between 1200 CE and 1400 CE. Thousands of obsidian points discovered on Easter Island’s south coast are considered by some archaeologists to be weapons, pointing to a massive war among the island’s population as they started to compete for the dwindling resources. Earlier this year however, that interpretation of the evidence was called into question by a studysuggesting the points weren’t in fact weapons. Other explanations suggest that the deforestation was caused by a plague of rats who ate the island’s palm fruit, or that in fact the cultural extinction was a result of Europeans arriving on the island, wiping out the population through slave trading and the unintentional spread of diseases the islanders had no immunity to. Taking advantage of the latest analytical methods, Rull and his team are beginning to shed light on many of the uncertainties in the history of Easter Island. In particular, complete sedimentary samples for the last 3000 years have revealed how drought and wet seasons may have influenced the island’s population. Periods of adverse weather could have affected sea travel to and from the island, leading to periods of isolation. Times of drought could have triggered the deforestation shown in the pollen record. Other evidence, such as radio carbon dating and DNA analysis of artefacts and human remains, has provided insights into Easter Island’s inhabitants. It is now possible to see where the islanders lived, what they farmed and ate, and how other cultures influenced them. By combining all of this newly available evidence, the complexity of the Rapa Nui’s story is being revealed. “These findings challenge classical collapse theories and the new picture shows a long and gradual process due to both ecological and cultural changes. In particular, the evidence suggests that there was not an island-wide abrupt ecological and cultural collapse before the European arrival in 1722,” said Rull, in a press release. The causes of the extinction of the people of Easter Island remains a mystery, but the work of Rull and his colleagues shows that to truly trace the story of the Rapa Nui, a combined approach studying climate, ecology, and culture is necessary.